The story in this year’s PBA All-Filipino Cup Finals series should be one for the record books, for more reasons than fans would expect. 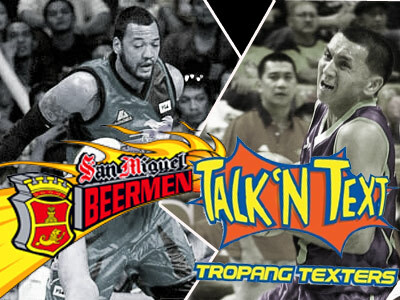 For starters, this is the first time the San Miguel Beermen and the Talk N’ Text Tropang Texters will meet in an All-Filipino finals, which accordingly, are the top two seeded teams with 16 wins and 5 losses a piece. Also note that this is Ato Agustin’s first season as PBA coach, and this is his first trip to the finals. Ato once played for opposing Coach Chot Reyes too, which makes this the first time a former player stood head to head with his former coach in a finals series. But more than anything, a slew of firsts will be capped off by a single last, that of veteran Beermen guard Olsen Racela’s. The current PBA season is reportedly Olsen’s last, which makes the final few games all the more worthy of our viewing time. Chot is partly to be credited for the Beermen’s ongoing success. He once brought the team to the 2007 PBA Finals before taking over the national team, where he took Beermen star Arwind Santos under his wing. Nash Racela, Olsen’s brother, is also Chot’s assistant coach for the Tropang Texters. Suffice to say Coach Chot’s got all the internal information he needs. Tropang Texter Jason Castro finished Game 1 last Saturday January 22, with a game high 16 points and five assists off the bench, leaving Coach Ato dumbfounded on how to defend the 5’10” guard. “Even before the series, I was thinking Jason would give us a big problem,” says Agustin, as reported by PBA News. His solution: designate Racela to make sure Castro doesn’t have a repeat performance. The Beermen found them selves struggling to make open shots, thanks to the Tropang Texter’s pressure defense to the team’s regular ball handlers. Shot selections coming from San Miguel on Game 1 were limited and they were also outrun on the other side of the court. Fast break plays were also a factor for Talk N’ Text, with Jason Castro and Ryan Reyes each finishing plays. Key players Arwind Santos and Jay Washington did a better job scoring inside (8-13 FGA combined) than from beyond the arc. Santos struggled with his treys and has made only one out of eight attempts. Game 2 proved to be a much better shooting night for the whole team, finishing 52% from inside despite losing again to the Tropang Texters 110-102. Game 2 saw all players of the Tropang Texters sharing respective workloads, with Jared Dillinger, Jason Castro, Jimmy Alapag, Ranidel de Ocampo, Ali Peek, and Harvey Carey all scoring in double figures. Playing time was also well distributed within the team, with Alapag playing the most at 32 minutes all the way to Jason Castro getting the most out of his 21 minutes. The Beermen found themselves making only half of every attempt at the line. San Miguel finished Game 2 struggling to complete free throws with only 21 made out of 30 attempts. Those are 9 points they gave away, enough to clinch themselves out of an 8-point deficit in the final minutes of Game 2. Clearly, the team needs to make the most out of their charity strikes.